A critical aspect of Christian theology is the confession that salvation comes to those who are "in Christ." But what does that mean? For some it means orthodoxy, right belief. Those who are "in Christ" are those who overtly and publicly confess that "Jesus is Lord." The trouble with that notion is that Jesus explicitly teaches against that view: Matthew 7.21: "Not everyone who says to me, ‘Lord, Lord,’ will enter the kingdom of heaven, but only the one who does the will of my Father who is in heaven." So there seems to be more to being "in Christ" than the confession that "Jesus is Lord." It seems that, to be "in Christ," we have to "do the will of the Father." Here we move away from orthodoxy to orthopraxy, from right belief to right practice. 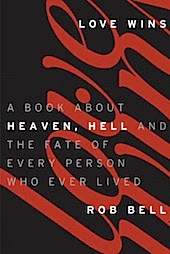 This is an old and ongoing debate, and it sets the backdrop for the most provocative chapter in Roll Bell's Love Wins. Chapter 6 of Love Wins is entitled "There are Rocks Everywhere." This is my favorite chapter of Love Wins as it is the most theologically creative. The chapter is, at root, a chapter about Christology (the doctrine of Christ). Early in the chapter Bell points us to the story in Exodus 17 where the people of God are thirsty in the desert and call on Moses and God for water. The LORD answered Moses, “Go out in front of the people. Take with you some of the elders of Israel and take in your hand the staff with which you struck the Nile, and go. I will stand there before you by the rock at Horeb. Strike the rock, and water will come out of it for the people to drink.” So Moses did this in the sight of the elders of Israel. For I do not want you to be ignorant of the fact, brothers and sisters, that our ancestors were all under the cloud and that they all passed through the sea. They were all baptized into Moses in the cloud and in the sea. They all ate the same spiritual food and drank the same spiritual drink; for they drank from the spiritual rock that accompanied them, and that rock was Christ. How is that? Christ is mentioned nowhere in the story. Moses strikes the rock, it provides water, and the people have something to drink. Paul, however, reads another story in the story, insisting that Christ was present in that moment, that Christ was providing the water they needed to survive--that Jesus was giving, quenching, sustaining. Jesus was, he says, the rock. Without anybody using his name. Without anybody saying that it was him. Without anybody acknowledging just what, or, more precisely, who--it was. Where else has Christ been present? because Paul finds Jesus everywhere. It's one thing to be the Messiah (low Christology) and quite another to be the Logos through whom the world was created (high Christology). Here we find echos of the Christology of John 1. Through the Son "all things were created." More, all things were created "for him." The Son is the telos, the goal, the direction, the end point of creation. Everything is heading toward the Son. Still more, "in him all things hold together." The Son is the animating force of the cosmos, the fabric or web holding everything together. Here we see the idea Paul was gesturing toward when he said "that rock is Christ." Jesus is everywhere in creation. Finally, the Son will "reconcile to himself all things...making peace through his blood shed on the cross." 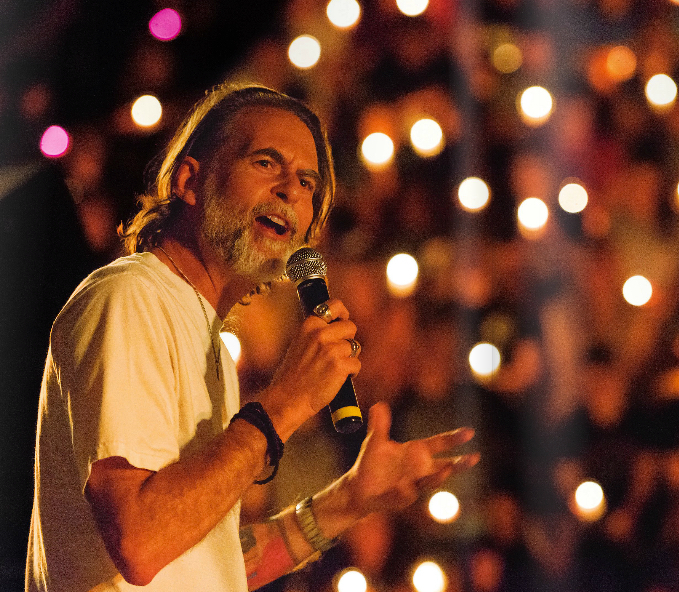 In light of the high Christology of Colossians 1, 1 Corinthians 10, and John 1--where Christ is "everywhere" and holds "everything" together--we wonder what it means to be "in Christ." If Christ already holds everything together isn't everything, in a sense, already "in Christ"? In short, a high Christology might radically reconfigure what being "in Christ" might mean. We might, for example, be "in Christ" in the same way the Jews were in Exodus 17. Saved, rescued, sustained, and blessed without realizing Christ is there, without confessing that Christ is present. This, obviously, raises a host of questions about how Christians relate to other world religions. Might there be Exodus 17 rocks in the experience of other faiths outside of Christianity? Might other religions, like the Jews in Exodus 17, be saved by Christ without their explicit awareness and confession? [T]here is an exclusivity on the other side of inclusivity. This kind insists that Jesus is the way, but holds tightly to the assumption that the all-embracing, saving love of this particular Jesus the Christ will of course include all sorts of unexpected people from across the cultural spectrum. As soon as the door is opened to Muslims, Hindus, Buddhists, and Baptists from Cleveland, many Christians become very uneasy, saying that then Jesus doesn't matter anymore, the cross is irrelevant, it doesn't matter what you believe, and so forth. In sum, what we see in all this is how a high Christology can create space for a more inclusive vision of God's saving purposes while holding onto the exclusivistic claim that all are saved "in" or "through" Jesus Christ. It's all a matter of how big your Jesus is. About if you think there are any more Exodus 17 rocks out there. That said, I think skeptical readers of Love Wins will wonder about Bell's handwaving remarks that his high Christology hasn't thrown out the cross. And to be honest, it's true that he doesn't do a lot more in Chapter 6 to explain how the cross fits into the cosmic Christology he's deployed. So, to end this post, I'd like to sketch out something along these lines, something that Bell could have said in response. And it has to do with how I started the post, with the distinction between confessing "Lord, Lord" (which doesn't save you) versus "doing the will of the Father" (which does save you). The issue, again, goes back to what it might mean to be "in Christ." More specifically, how does the cross get us "in Christ" when Christ is everywhere? To get at an answer I'd like to borrow from the panentheistic analysis of Jürgen Moltmann in his book Trinity and Kingdom. Specifically, the "Christ is everywhere" formulation might lead us to assume a pantheistic position where we see an equivalency between God and creation. This doesn't seem very orthodox, but if we resist this equivalency what are our options? What might it mean to say that God creates something that exists "outside" of God? Can anything be "outside" of God? Isn't God omnipresent? And if God is omnipresent then how can creation exist outside of or externally to God? Creation has to be "in God" in some form or fashion, correct? And if so, doesn't that lead to pantheism? Not necessarily. According to Moltmann, building off some Jewish theologians, God's creation involves two parts. The first part is God's withdrawal. A negative action of God to create space for creation. This "making room" for creation involves an act of self-limitation on God's part. After this negative space has been created the second, positive act of creation can occur. Here God speaks a positive word into the vacuum that was created through God's self-limitation. These two phases of creation are like breathing. First, a breathing in--passivity, vacuum, a pulling in. Followed by a breathing out--activity, creation, a moving out. This formulation creates a panentheistic position. God isn't equivalent to creation. Nor is creation "outside" or independent of God, a object "beside" or "next to" God. Rather, creation is a space within God, a negative space that God has evacuated to make room for the Other. This is a very paradoxical space. We are "in God" but in a way marked by the absence of God. We exist in a space that God has evacuated. Because of God's self-limitation the space of creation is marked by god-forsakenness, the loss or lack of God. We exist--positive creation--because God has self-limited--negative creation. The practical implication of this panentheism is that God can only appear in creation--the space of God's self-limitation--as weakness. God lets himself be pushed out of the world onto the cross. He is weak and powerless in the world, and that is precisely the way, the only way, in which he is with us and helps us. Matt. 8:17 makes it quite clear that Christ helps us, not by virtue of his omnipotence, but by virtue of his weakness and suffering. All this is just a theological way of saying that "God is love" (1 John 4.8). Love--that is how God moves in this world, this space of God's self-limitation. This is why some of the church fathers proclaimed that "force is has no part of God." And this brings me back to the start of the post. What does it mean to be "in Christ"? It means to love. To love as Jesus loved. To live a cruciform life. To take up our cross and follow him. Yes, it's true that "Christ is everywhere." But what does this mean? I think it means that wherever love exists God is present. Because God is love. And that is how the cross is necessary for us to be found "in Christ." True, in one sense, as created beings, we are already on the "inside," but in a god-forsaken way. To exist is, to some extent, to be on the inside of the omnipresent God, but this existence is in the space of God's absence. So, to really be on the inside of creation, to be with God in creation, we need to go through the cross, to follow the path that Jesus walked. Jesus on the cross shows us the Father, shows us where God is located in this space called "creation." And when we follow Jesus to God, when we go through the cross, when we love, we find the Father in this world. On the cross Jesus shows us that "God is love." So we pick up our own cross to "do the will of the Father." And this, according to Jesus, is what saves us. This is how the cross allows us to be truly and fully "in Christ." I agree with the high Christology. However, I don't see any need to appeal to pantheism or panentheism; neither of which fit into orthodox Christology where Christ is fully God and fully man but not confused. As for those who may be concerned about the blend of exclusive and inclusive, Paul does say elsewhere to "make your election sure". The Cross of Christ provides assurance of salvation, but the effectiveness of that salvation goes far beyond whatever boundaries we imagine. Of course, it is God's choosing and not ours. I would also point to the passage that says only "blasphemy of the Spirit" will put us beyond the reach of salvation. While a bit vague in our underdeveloped theology, it does suggest that the unsaved may be a more limited set than we think. Bell's and your thoughts. But at a certain point, I think, one is just making fly specks--and they are easy enough to leave on all sides in most debates. So I'm following your lead and reflecting on which side asks me to follow Jesus' example, and which side makes that more difficult. Thanks, Richard. No fly specks this time. Correct me if I'm wrong but being a christian, to me, has very much to do be being humble towards God and confessing that it is only through His grace and not works of our own that we can be reconciled to Him. And confessing that Jesus is Lord means that we should live our lives in obedience to His will, and, as Paul did, become a bond-servant of Christ. So when you say that to be "in Christ" means simply "to love", I wonder if it is all that clear what "loving" means. Now to someone who is completely ignorant to the gospel, this seems reasonable enough, but to someone who is familiar with the life of Jesus and still chooses other religions or faiths over Christianity and refuses to confess Jesus as their lord and savior, is it possible that he/she understands the meaning of "love" as God wants the word to be understood? loved. To live a cruciform life. To take up our cross and follow him." Given that, I'm not sure what you're asking exactly. I may be oversimplifying (or I simply misunderstood) but the main idea I'm getting is that a person doesn't need to proclaim Jesus is Lord, instead, if he is doing God's will, and loving as Jesus loved (even though he may not be aware of his loving as "Christ-like") he is "in Christ". And so Jews, Buddhists, Deists... everyone can theoretically be "in Christ", just without realising it. My question is this: to someone who is familiar with the bible and Jesus and still chooses other religions, how can he follow Him while denying His claim to be the way, life and truth? More precisely, how can a buddhist believe in salvation when he denies God's existence and found his faith on the nothingness of reality? Personally, I have found Matt 12:31 much easier to deal with since adopting, as you have, a high Christology. My reading now (from MacDonald) is that the blasphemy against the Spirit describes the attitude taken by one who recognises the Spirit's conviction but chooses to reject God's will. This is unforgiveable by definition, rather than because of any notions of divine wrath, justice etc. God cannot forgive where his will is resisted. This makes the attitude the barrier to forgiveness rather than God's character. Since God's love "never gives up" and "never fails", we can hope than one day "every knee shall bow" willingly before his loving purpose. I think I see where you are heading. 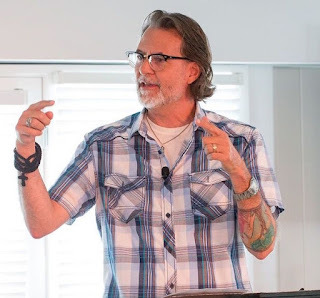 To clarify a bit, what I was trying to do in the post was to explore the connections between a high Christology, panentheism, love, orthopraxy, and the cross. So the post is simply a thought-balloon about how these things might fit together, if at all. The point being, your question is going in a direction I wasn't really thinking about. Which is fine, as I think it's important to explore the implications of these thought-balloons. I just want to mention that I was mainly trying to think about the connections between a cosmic Christology and the theologia crucis, two thing that often don't fit well together. But to get to you question. I think the root of the matter is the relative importance of orthodoxy and orthopraxy. Or, phrased differently, the role of cognitive assent and behavior. What do I have to have right in my mind, doctrinally speaking, if anything? What if a Buddhist cognitively rejects "Jesus" as the way, truth and life? What might that mean? What "Jesus" are they rejecting? The Jesus on the billboards of those holding "God hates fags" signs? The Jesus of Christians who neglect the poor? And on and on? That is, are they rejecting the "Christian Jesus," the "idol Jesus," the "religious Jesus," or the real Jesus? Here, it seems to me, it gets real complicated. Because what if a person moved away from "Jesus" to say, "I'm leaving this shallow, hate-filled 'Jesus' to follow the way of love." In that moment, wouldn't Jesus have done the same? Wouldn't rejecting "Jesus" in that instance be following Jesus? Where is Jesus exactly? I really doubt the Christians have him. How do you locate Jesus in the word? It seems clear to me that the reality of Jesus and the religious use of the label "Jesus" are two very different things. Again, this seems to be the point of Matthew 7.21. To be sure, this opens up a lot of heretical avenues. I'm not suggesting that you or I go down any of those paths. I'm just recommending that we pause to think a bit about what the Incarnation might mean. That God, in this world, was numbered with the transgressors and that the religious might be the least aware of where Jesus is in the world. Then I guess it all comes back to the authority of the bible and its ability to portrait for us an authentic image of Christ. And this also is where one of my biggest questions for universalism lie. True love demands free will, and if everyone one way or another goes back to God in the end, doesn't this defy the whole purpose of giving humans this choice? Anyway, perhaps thats for another discussion. Thanks for this wonderful post - something in me finds a quiet joy in so much of what you write. 'One main doubt and terror which drives men towards the revelation in Jesus, is this strange thing Death. How shall any man imagine he is complete in himself, when he knows that he knows neither the mystery whence he sprung by birth, nor the mystery to which he goes by death? God has given us room away from himself."... How can I live in peace without the God who ordered it thus? Your post helps me to make sense of this recurring, yet uncharcteristically tentative point from GM. I wonder if any readers - @Patricia? - can point me to a fuller exegesis of this element of GM's theology which pops up here and there like one of his 'single flower' leitmotifs? I don't know if you've read my posts on free will and love, but, as a psychologist, I'd disagree with the axiom "true love demands free will." The reality, I think, is that free will undermines love. If the will is free love cannot exist. Love is a constraint upon the will. Free will fosters hate, apathy, evil, and callousness. He sets an open path before us; WE must walk in it. ... God's gift glides into man's choice. It is needful that we should follow with our effort in the track of his foregoing power. To refuse is to destroy the gift. "to someone who is familiar with the bible and Jesus and still chooses other religions, how can he follow Him while denying His claim to be the way, life and truth? More precisely, how can a buddhist believe in salvation when he denies God's existence and found his faith on the nothingness of reality?" 1 Cor. 12:3 ... no one can say "Jesus is Lord" except by the Holy Spirit. Familiarity with the Bible and Jesus, as you put it, has no bearing on whether that information leads to their faith in Jesus... at least that's what the scripture seems to say. It is God's choice as to when to reveal Himself to anyone... not ours. Interesting, to which posts are you referring? Perhaps I can read them and learn more. How simple... nothing is left out. How beautiful. This is true love, that nothing is beyond its reach. Hi Andrew, I'm in the Curate series myself right now (just finished Curate of Glaston, the Michael Phillips' English edit of Thomas Wingfold, Curate), and just started the second one (The Lady's Confession). Curate deals with the imminent death/fear of death from the point of view of a repentant murderer and those who know and love him, and why we have no positive assurance that faith is substantive beyond life as we know it. Its immediate sequal deals with the atheism of a good man, whose idea of God's absence is a matter of both lack of evidence and his being as good if not better in practice toward his fellow men as professing Christians are. From Curate: "Satisfy people's desire to know this and what have they gained? A little comfort perhaps - but not a comfort from the highest source, and possibly gained too soon for their well-being. Does it bring them any nearer to God than they were before? Is He filling one more cranny of their hearts in consequence? Their assurance of immortality has not come from knowing Him in their hearts, and without that it is a worthless knowledge. Little would be gained and possibly much would be lost - and that is the need to trust Him beyond what our minds can see. Trust is born in love, and our need is to love God, not apprehend facts concerning Him. Remember Jesus' words: 'If they do not listen to Moses and the prophets, neither would they listen or would they be persuaded though one rose from the dead.' He does not say that they would not belive in a future state though one rose from the dead - though most likely they would persuade themselves it had been nothing more than an illusion - but they would not be persuaded to repent....No, Mr. Drew (sic), I repeat, it is not a belief in immortality that will deliver a man from the woes and pains and sins of humanity, but faith in the God of life, the Father of lights, the God of all consolation and comfort." I don't know if this is directly related to what you were asking. I know of only one other reference in which MacDonald talks about the need for created individuality apart from God., in Unspoken Sermons Vol. 1, Love Thy Neighbor. Seems like maybe there is another reference, but I can't put my finger on it right now. Does this help? Patrick, this is a response to your question below. These threads only go six deep. Oh goodness, I've spilled thousands of words on this topic. Start with the posts under Cartesian Storm on the sidebar. Also, Part 6 of this Love Wins review gets after some of these issues. But here's a quick response. "Free will" is psychologically incoherent. The human volitional system isn't independent of human biology or other aspects of human psychology (e.g., the emotions). The closest thing we have to "free will" in human experience, decisions free and unconstrained by things like character, pleasure/pain, and basic human feeling, is the sociopath. Sociopaths have the freest will on the planet. They can, for example, decide to kill you or be nice to you. Both options are open and free to them. But for most of us, such a choice never even reaches awareness, never presents itself as a choice to begin with. It is closed off, unthinkable. Thus my point about love being a constraint and freedom producing evil. "If the will is free love cannot exist. Love is a constraint upon the will. Free will fosters hate, apathy, evil, and callousness." I have come to the same conclusion, that a "free" will is one that can equally choose to do good or evil - the sociopathic mind, lacking a conscience - one that feels no difference between doing harm or good. And as such it is NOT something that anyone should want. You have a beautiful way with words. Thanks for that. I recall listening to a tape by the Reformed apologist, R.C. Sproul, a long tome back in which he made the off-hand comment that, however bad we must admit the Inquisition was, it cannot be called illogical: If you really believe that a person is damned to eternal hell fire for not confessing the right belief in the right way, torturing a person to illicit the right response is a very loving thing to do. The real problem for most of us, I think, is not that we're likely to torture anyone in the name of God's love for them, but that particular churchs' missions will continually be skewed so that it's focus will not be recognizable as love to anyone who does not share the obsession with saving belief. You've made the background arguments in these and other posts, but the interesting thing to me is that the Evangelical/Calvinist point of view must, at some level, endorse the logic behind--if the the extremity of--the Inquisition. So much can't be said to be clear in sorting out interpretive possibilities in the gospels, but I simply cannot imagine the Jesus presented there doing anything but branding the hypocrisy of such a position into our hearts and minds with the most scathing rhetoric imaginable. I'll confess a little delight in considering the rhetorical possibilities. I guess I'm stumbling toward this point. To argue theology with an Evangelical who is obsessive about getting theology right is, in a sense, to concede the point of their obsession: it's THAT important. In which case...maybe the Inquisition starts to make sense, and maybe it's important to argue that scripture has no errors, and that I have not made any errors in interpreting it, in which case maybe my sect needs to separate from yours... A hell of a lot of mischief seems to be related to this obsession. Whatever this "blasphemy" may be, Jesus says it can't be forgiven in "this age" (i.e. the pre-cross/resurrection age) or "the next" (i.e. the age between his resurrection and return/unveiling - the one we're living in now). In other words, it is temporary, and cannot stand in the way of the person's recognition of Jesus and reconciliation to God. When God is all in all, the "blasphemy" will be irrelevant and non-existent. OK - answered my own question! It seems to be GM's language of the will - room to get things wrong, and by so doing, to learn the will of God if we so choose. A gift indeed! Plus it fits nicely with Richard's thoughts on the will - GM talks about 'free will' being a will that is perfectly at liberty to obey the will of God, not constrained by sin - I really love this reversal of meanings. I agree, even as I too stumble. Living in a 21st century western society, I want to shout "what do you mean by "'love'"? How are you expressing it, and is it as "good" for you as the other person? That is really the heart of my dilemma. I think there are as many definitions as there are people. If you want to see love (i.e., "compassion") gone terribly wrong, just look at the Great Society and our subsequent bankruptcy. "confessing "Lord, Lord" (which doesn't save you) versus "doing the will of the Father" (which does save you)." There really isn't much 'orthopraxy' required to have eternal life. Only beholding (how can any but those living Israelites have seen Him???) and only believing, at least according to Jesus. That is unless you can find a better definition of 'doing the will of the Father' than the one that we have directly from Jesus. And, He never said 'pick up your cross' and be saved or even confess Me and be saved. "What does it mean to be "in Christ"? It means to love. To love as Jesus loved. To live a cruciform life. To take up our cross and follow him." "... but the interesting thing to me is that the Evangelical/Calvinist point of view must, at some level, endorse the logic behind--if the the extremity of--the Inquisition." Alas, I found the reference I could not remember. I'm glad you enjoyed the Parish series. MacDonald's characters, though dated to their period, seem so believable as profiles go. In the preface to the second Curate novel, Michael Phillips says, "George MacDonald once commented that he thought Paul Faber, Surgeon the best of his novels." I'm thinking that he seems to show how the church itself has made more athiests than recruiting athiests ever could, as Richard points out below that the Jesus people reject often isn't really Christ, but the Jesus represented to them through churchianity and proud, "right" Christians. OneForAll, your interpretation is not congruent with the early church both with respect to the ages and the consequences. Then God will be all in all. This was taught in the early church by the apostle Paul. his life, his spirit, his bounty? Andrew, I am a fan of MacDonald and agree with this interpretation of blasphemy. However, while I believe in universal efficacy of the Cross, this does not automatically lead to universal redemption. I believe the set will be large, but we cannot say 100% on the basis of what has been revealed. We should all approach the question with some confidence and yet some healthy fear. "Free will fosters hate, apathy, evil, and callousness." Um...free will was created by God and has a good purpose. These things CAN happen, but not a given. "Rather it says that one who is saved by God because they do His will (believe) are placed 'in Christ' by Him." As one who apparently DID His will (believed) David, are you taking credit for that action while others are blamed for not doing so? If so, then you are suggesting salvation by works. If your belief was an act of GOD, and not yours, then you are admitting (along with your belief in the salvation of only a remnant few) that God does not desire to save all men because He has obviously refused to give belief to all. Thank you so much for this, Richard! I have seen hints at eventual universal salvation in the Bible for years - but wondered if I was being a little heretical for thinking so! Even children ask the question (I know I did!) "But what about those who have never heard about Jesus?" The church has glossed over it - or worse - given horriffic, graceless, loveless answers, for years. I've been devouring my way through your blog since discovering it a short time ago - what you are saying really fits with the story I see in the Bible, the character of this person Jesus, and so many of the questions that have nagged at me for so long!! Thank you, thank you, thank you!! So how does your view of God as "all in all" differ from say Christian Science (God is everything. Evil is nothing.)? I'm still as captivated by Jesus as I ever was but sometimes I wonder if we fall into ditches if we don't make a distinction between him and the Cosmic Christ. What if the Cosmic Christ is so big that it expands outwards even past Jesus, or any one person or manifestation, to include others as well? Hey, Susieq... I have this feeeeling.... (& I'm kind of "playing around" with thoughts and intuitions etc here too) that if we really follow love - HE is what we'll find. Maybe not by that name. Maybe not in the traditional Christian religious form. But it will really be Him. There are bits of truth and deep insights in all kinds of traditions and philosophies - but they (whether by name or not) point to Him. And now I'm going to leave it to the *real* theologians to answer properly - but this is what my gut says... has been saying for a while now. I'm as interested as you to see what others have to say! present world, not about our ultimate fate. which Jesus is the savior. “Election” is not mentioned many times in the bible. hardly a sentence of eternal torment! about a dual outcome (bliss vs. torment). things were created." More, all things were created "for him." will be able to give his life to us directly, freely, without hindrance. of ALL authority, and destroyed ALL enemies, the last of which will be death. As I've told Richard before, you and I share more agreement than disagreement. We just seem to draw the line a little differently. I agree with you on many points here. I just see you carrying it further than the text allows, but certainly no further than the hyper-Calvinists carry it in the other direction. You may percieve my position wrongly because of past debates you have had. My position is more closely aligned with Barth and Torrance. "are you taking credit for that action (believing) . . ."
You know I don't. Nit, believing is not an action, deed, work, etc. "while others are blamed for not doing so?" "you are admitting . . . that God does not desire to save all men because He has obviously refused to give belief to all." Here we are again; 1 Timothy 2:4 as a proof text. The problem in this text is to decide if 'all men' means 1) each and every individual or 2) individuals from all categories of men. Simply saying 'God is love' does not really address the exegetical question. If we follow your line of thinking, does it mean that ultimately no one is responsible for whatever one does? If choice is an illusion and we are all slaves to the situation in which we come to this world, how we were brought up and who we associate with, who can blame us for acting the way we do? You wrote in Love Wins Part 6 that free will is self-ownership. But I believe that free will is not true freedom, in fact Jesus said that the truth will set you free, and to me proclaiming Jesus as Lord (the truth) means acknowledging that decision to give up self-ownership to God and changing your life (or having your life changed) as a consequence of this decision. Anyway back to the original discussion about following Christ. I think the single most significant event in history is that Jesus rose from the dead, which in effect declared his divinity and God's salvation. To confess Jesus is Lord is, first and foremost, admitting that you believe in his resurrection. Now I think it is the believers' responsibility to study the bible and find out "who Jesus was" for themselves and just as the bible says there will be those to whom Jesus says "I don't know you", but the question that everyone (Buddhists, Jews, Americans, Chinese...) has to answer is whether he/she believes in the resurrection of Jesus Christ, and the answer can only be yes or no. As clearly as the bible says, "for there is no other name under heaven given to men by which we must be saved", I just don't see how salvation can reach those who says no to that question. The gist of the matter is, God loves us, and for God to establish a loving relationship with us, He must also give us the choice not to love Him back or otherwise we would be like robots, His love for us is manifest through the giving of His son Jesus Christ for our sins, and we can respond by either accepting or rejecting such invitation for a reunion with God. This whole concept seems pretty water tight to me, and there will be those who choose not to reunite with God, wherever they go I have the slightest idea, but nonetheless it is their choice. Yes, thank you, all is well with me and mine. Believing is a verb, and therefore an action, and therefore something you DID and someone else DID NOT. If you are receiving salvation for having DONE it, then it is being "credited" to you as an action that you took, and you should be proud of your accomplishment. If it was God's actions which gave you faith - belief - then He rightfully deserves the "credit" for your salvation, and the "blame" for the damnation of others whom He refused to give belief to. For God to "blame anybody for not believing," and for you to claim that believing is something that we must DO in order to be saved, is to give us responsibility for our own salvation. That is salvation by works, pure and simple. If, on the other hand, you are going to claim that our salvation is completely the work and choice of God, then you should also be claiming that our damnation is completely His work and choice as well. You can't have one without the other. Whether or not He chooses to save ALL men, or only from all CATEGORIES of men, is certainly a question that you should ask yourself. And while you are doing so, please ask yourself if God could be said to "love" those He submits to eternal conscious torment... however you define the word. If you are then willing to admit that God does NOT love all men - and demonstrates this through His choice not to save them - then more power to you. But please do not ask me to praise or worship your "god," for I cannot love a "god" who directs me to love all of my fellow man, but refuses to do so himself. Been away from the internet for a couple of days... A thought to tag onto yours. Though I've only read small bits of the Institutes, I can't believe that Calvin's "predestination" can be viewed as a theological version of materialist determinism: to choose that view makes God the author of evil. But then when acting outside the theological domain there is no need to posit determinism, while there is one to posit free will with respect to "the fall." Furthermore, there is a need to posit that God acts on the fallen world, if for no other reason than to sovereignly save whomever God chooses to save. Only God saves, but God can use whatever or whomever God so chooses to elicit grace. Talk about seeing through a glass darkly! No wonder--if Weber was right--the Protestant work ethic resulted: if there's no understanding of how God's grace works, all we can do is look for evidences of it. So you're right, any talk of logic is off base. But I think that Sproul's point was much more modest. Desperate measures are reasonable in desperate circumstances. And my point was--and I would like to think of it as the very model of modesty-- that unreasonable consequences can be expected to stem from positing such a desperate circumstance (eternal hell). "God acts on the fallen world, if for no other reason than to sovereignly save whomever God chooses to save"
And that is THE question that divides Calvinists, Arminians, and Universalists: Just WHO is God going to save? Thanks for that, Sam. It's nice to know I'm not alone. Richard, brilliant post as usual. OK, it looks like with all the commenting that I am late in the subject, but I will jump in. :-) I can ascribe to the idea of a "High Christology" including in the ranks of heaven more than strict Orthodox Christians. What I mean is that that just because we , as Christians, call out for salvation out of knowledge, that does not mean that someone cannot call out of ignorance. In Romans 2:14-15 we see that the Gentiles have the law written on their hearts and when their hearts condemn them they are keenly aware of a need for salvation. So if they call out to mercy, even though they don't know which name to call out to - won't they be saved? As for final punishment, that is a different issue. While I agree that God is Love, that is not the only dimension to His character. Romans 9:22 makes it clear that through sovereign choice some are given to glory and others damnation. It is by God's good pleasure that He uses us as created instruments. Why are the fallen angels evicted from Heaven while we are given redemption? God's sovereign will. I believe there are reasons behind it, but at the end of the day we are His creation, He is divine. Now as to the nature of Hell, whether it is forever or that of utter consumption... that is another matter entirely. when I read this I thought of Gungor's song "Late Have I Loved You". if you don't know it you need to go listen to it now. you'll love it. It's worth pointing out that the word "Jesus" isn't the name Jesus would've heard to begin with. That we insist people call him "Jesus" can miss the point. If they are living self-abasing compassionate lives out of love for God, then they are embodying Christ and worshipping Christ and confessing Christ with their lips and their actions, regardless of whether or not the spoken words "Jesus Christ" ever escape their lips. If they are not living in this way, then whatever faith they practice has nothing to stand on, because if it claims to love God then it will show love to people, and if it shows love for people but not for God then it is in error to begin with. My son mentioned this approach to understanding Christ to me. He did so after I expressed similar views. I have come full circle back to Christ after becoming aware of the concept of the logos as it is the source of the gospel. Glad to stumble onto to this. I had goggled lectures on the Logos concept and this came up. Thanks.